What is Mercury and what’s the big deal? Mercury is a neurotoxicant. Outbreaks of methylmercury poisonings have made it clear that adults, children, and developing fetuses are at risk from ingestion exposure to mercury. When mothers with no symptoms of nervous system damage gave birth to infants with severe disabilities, it became clear that the developing fetal nervous system is more vulnerable to methylmercury than is an adult’s nervous system. 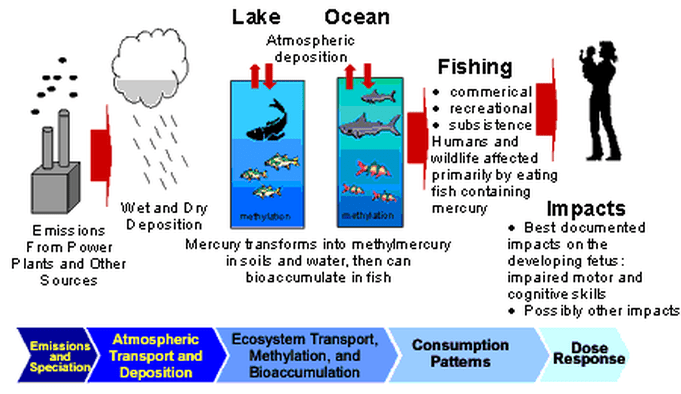 The most common way people are exposed to any form of mercury is by eating fish containing methylmercury. Other exposures include breaking products containing elemental mercury and using compounds that contain mercury. the health of the person exposed. Where might I find Mercury in my home? Use this Mercury Search to locate mercury containing items in your home. Mark them with stickers or some other form of identification as a reminder to ensure the mercury gets recycled. Store these items out of children’s reach. Handle the products carefully to avoid breakage or spills. Remove unnecessary mercury-containing items from your home and take them to your local mercury recycling site. _____ Thermometers- silver-colored liquid inside. _____Fluorescent and other mercury vapor lighting- HID (high intensity discharge), metal halide, high-pressure sodium and neon bulbs. _____Automotive headlamps- blue tint when lit. _____Pilot light sensors- in some gas appliances: stoves, ovens, clothes dryers, water heaters, furnaces, space heaters. _____Gauges- barometers, manometers, blood pressure and vacuum gauges with silver-colored liquid. _____Switches and relays- in some chest freezers, pre-1972 washing machines, sump and bilge pumps, electric space heaters, silent light switches, vehicles and farm equipment. _____Clothes irons- automatic or tilt shut-offs. _____Elemental mercury- silver-colored liquid metal sometimes found in children’s chemistry sets. _____Vintage toys- toy drawing screens and mercury maze games. _____LA Gear® athletic shoes- made before 1997 with flashing lights in soles. _____Batteries- mercuric oxide and some alkaline batteries. _____Paint- latex manufactured before 1990, and some oil base-paints; check the label. _____Thimerosal or merbromin- in some antibacterial products. How can I safely dispose of mercury? Residents can bring Mercury products to the Household Hazardous Waste Collections. Make sure that the material is in a labeled and sealed container.